The African Union Mission in Somalia (AMISOM) is in a period of transition. After a year of military successes it needs a new mandate to support the new Federal Government of Somalia, which has identified provision of security across the country as a priority. Both the UN Security Council and the African Union’s Peace and Security Council are currently reviewing AMISOM’s mandate. 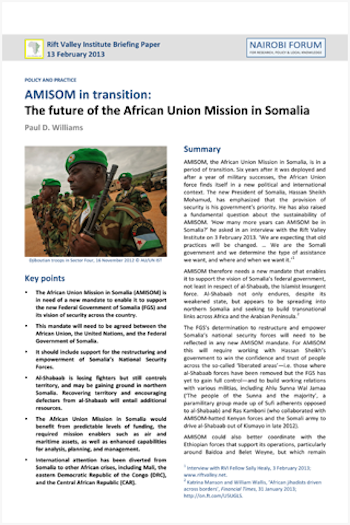 In this Nairobi Forum Briefing Paper, ‘AMISOM in transition: The future of the African Union Mission in Somalia’, Paul Williams, Associate Professor at George Washington University, describes the mandate, finances, and force posture of the mission, and assesses current and future challenges. Previous Nairobi Forum events exploring the challenges facing the post-transition Somali government have included ‘A Somali Spring?’ and ‘Rethinking state-building in Somalia’. See the calendar for upcoming Forum events. Read the full briefing below or download as a PDF. The African Union Mission in Somalia (AMISOM) is in need of a new mandate to enable it to support the new Federal Government of Somalia (FGS) and its vision of security across the country. This mandate will need to be agreed between the African Union, the United Nations, and the Federal Government of Somalia. It should include support for the restructuring and empowerment of Somalia’s National Security Forces. Al-Shabaab is losing fighters but still controls territory, and may be gaining ground in northern Somalia. Recovering territory and encouraging defectors from al-Shabaab will entail additional resources. The African Union Mission in Somalia would benefit from predictable levels of funding, the required mission enablers such as air and maritime assets, as well as enhanced capabilities for analysis, planning, and management. International attention has been diverted from Somalia to other African crises, including Mali, the eastern Democratic Republic of the Congo (DRC), and the Central African Republic (CAR). AMISOM therefore needs a new mandate that enables it to support the vision of Somalia’s federal government, not least in respect of al-Shabaab, the Islamist insurgent force. Al-Shabaab not only endures, despite its weakened state, but appears to be spreading into northern Somalia and seeking to build transnational links across Africa and the Arabian Peninsula. The FGS’s determination to restructure and empower Somalia’s national security forces will need to be reflected in any new AMISOM mandate. For AMISOM this will require working with Hassan Sheikh’s government to win the confidence and trust of people across the so-called ‘liberated areas’—i.e. those where al-Shabaab forces have been removed but the FGS has yet to gain full control—and to build working relations with various militias, including Ahlu Sunna Wal Jamaa (‘The people of the Sunna and the majority’, a paramilitary group made up of Sufi adherents opposed to al-Shabaab) and Ras Kamboni (who collaborated with AMISOM-hatted Kenyan forces and the Somali army to drive al-Shabaab out of Kismayo in late 2012). AMISOM could also better coordinate with the Ethiopian forces that support its operations, particularly around Baidoa and Belet Weyne, but which remain outside the mission. Another area of renegotiation is the relation between AMISOM and the international anti-piracy coalition off the coast of Somalia. In this context, it is worth noting that President Hassan Sheikh has also expressed reservations about the long-term presence of the Ethiopian forces and European naval forces in Somali territorial waters. So AMISOM faces both opportunities and challenges. The principal opportunities are the local and international optimism generated by the new FGS and the considerable progress that has been made in the fight against al-Shabaab. But major challenges remain. Four of them are discussed here: first, the task of empowering and restructuring Somalia’s National Security Forces; second, dealing with defectors from al-Shabaab and other disengaging fighters; third, ensuring the effectiveness of AMISOM’s on-going operations, especially in relation to securing its supply routes, consolidation operations, and reconfiguring its forces to deal with the current threat from al-Shabaab; and, fourth, securing predictable long-term funding for the mission. It is six years since AU forces deployed to Somalia in the aftermath of the Ethiopian military campaign that had installed the Transitional Federal Government (TFG) in Mogadishu in December 2006. During that six-year period, the AMISOM mission has evolved, reflecting the changing context in Somalia and international responses to the country’s many problems. Until the Ethiopian troops withdrew from Mogadishu in early 2009, AMISOM protected key members of the TFG and a number of strategic locations in the city from armed opposition. These included the air and sea ports, the presidential palace at Villa Somalia, and the K4 junction linking them. The AU originally envisaged that after six months a UN peacekeeping operation would take over from AMISOM. This did not happen for a variety of reasons but is once again the subject of debate. Following the Ethiopian withdrawal, the Ugandan and Burundian troops who made up the AU force became the principal barrier preventing the TFG from being overrun by al-Shabaab fighters—and AMISOM itself came under increased attack. During 2009 and 2010, bloody battles raged across the city but they resulted only in stalemate: neither AMISOM nor al-Shabaab could decisively defeat the other. Probably in an attempt to weaken Uganda’s resolve, al-Shabaab carried out two suicide bombings in Kampala in July 2010. These did not have the desired effect: instead of pulling out, Uganda responded by deploying additional troops to Mogadishu. Faced with a growing enemy, al-Shabaab launched a major offensive against the TFG and AMISOM during Ramadan of 2010 but the insurgents were repelled and sustained heavy losses. UN Security Council Resolution 2036, passed on 22 February 2012, increased AMISOM’s authorized strength from 12,000 to 17,731 uniformed personnel. This figure was reached in December 2012, including approximately 360 police. UN Security Council Resolution 2073 (November 2012) added an additional 50 civilian personnel to the mission. Uganda (c.7,000); Burundi (c.5,000); Kenya (c.4,000); Djibouti (c.950); and Sierra Leone (c.850). There are also two 140-strong Formed Police Units (FPUs) from Uganda and Nigeria. AMISOM then went on the offensive and engaged in many months of bloody street fighting across Mogadishu in order to expand its areas of control. The result was the withdrawal of al-Shabaab’s core fighters from the centre of the city in early August 2011, although fighting continued in the suburbs and outskirts for another nine months. In October 2011, Kenyan forces launched a unilateral military intervention, ostensibly in retaliation for al-Shabaab attacks on Kenyan territory (and the group’s alleged involvement in the kidnapping of foreigners), but also reflecting parochial Kenyan politics and interests. Shortly thereafter, Ethiopian forces once again entered Somalia and advanced on al-Shabaab positions across Bay, Bakool, and Hiraan regions. In December 2011, the AU, the UN, and their various partners developed a new Concept of Operations for AMISOM to take account of these major developments. The new Concept of Operations outlined a larger AMISOM force of nearly 18,000 uniformed personnel and hugely expanded its theatre of operations across four land sectors covering south-central Somalia (see AMISOM force posture, below). It also included a maritime sector, although AMISOM lacked significant maritime assets. This new posture was endorsed by the AU’s Peace and Security Council and the UN Security Council in January and February 2012 respectively. In the first half of 2012, Kenya, Djibouti, and Sierra Leone all signed memoranda of understanding pledging to join AMISOM. During this period, AMISOM also conducted operations to capture the remaining suburbs and outskirts of Mogadishu, most notably along the ‘Afgooye corridor’, a critical roadway linking the capital to the agricultural town of Afgooye on the Shabelle river. This was where hundreds of thousands of people displaced by fighting in Mogadishu since 2006 were located (and where al-Shabaab was said to have influence). AMISOM also successfully supported the conclusion, albeit somewhat behind the official schedule, of the so-called ‘roadmap’ to end the transitional institutions of government, which had been agreed in September 2011. The ‘Somalia End of Transition Roadmap’ is a detailed list of tasks aimed at directing Somalia towards the creation of permanent political institutions, as well as greater national security and stability. It was initialled by the Somali prime minister, the UN envoy to Somalia, representatives of the Arab League, the AU, and the Inter-Governmental Authority on Development (IGAD), as well as the leaders of regional entities (including Puntland) and pro-government militias (including Ahlu Sunna Wal Jamaa). With the selection of the new Somali government in August-September 2012, both the UN and AU concluded that they would have to review their engagement with the country and its new government. Unfortunately, the UN and AU reviews came to different conclusions about how to proceed (see below). AMISOM is thus in a period of potentially fundamental transition. Like all transitions, this one brings both opportunities and challenges, and AMISOM and its partners will be forced to make some difficult choices. AMISOM’s future is being shaped by the need to respond to several important recent developments. In the political arena, the most important of these was the selection of the new Federal Government during August and September 2012. President Hassan Sheikh’s insistence that it was the new government’s prerogative to determine the nature and timing of outside assistance were only the latest evidence of the determination on the part of the FGS to assert its autonomy on the basis that it is no longer a transitional mechanism but a sovereign government. Its initial six-pillar strategy—detailed in a formal policy document—is intended to make progress in the areas of stability, economic recovery, peace building, service delivery, international relations, and unity. This document laid the foundations of a new beginning for Somalia. President Hassan Sheikh has since amplified his government’s top priorities in the areas of security, reform of the judicial system, and public finance management reform. AMISOM has a Force Headquarters of approximately 85 officers in Mogadishu and is organized around four land sectors and one maritime sector. Sector One is centred on Mogadishu and staffed primarily by personnel from Uganda and Burundi. In southwest Somalia, Sector Two is run by Kenyan forces, with a new battalion from Sierra Leone set to deploy in February and March. Sector Three is focused on Baidoa, where Ugandan and Burundian forces are supported by Ethiopian troops. To the north is Sector Four where the Djiboutian battalion works with Ethiopian forces to stabilize the area around Belet Weyne. The Federal Government faces a whole host of problems and challenges, but arguably the most fundamental are ensuring the legitimacy and effectiveness of its policies with local populations beyond Mogadishu and generating sustainable revenue streams. Without success in these areas, the federal government will remain reliant on external supporters, whether in the diaspora or donor community, and its laudable plans will be left unimplemented. The FGS has also reiterated its calls for the UN arms embargo on Somalia to be lifted. A significantly weakened al-Shabaab has been displaced from some of its previous urban strongholds, most notably Kismayo. AMISOM deserves its share of credit for this. According to the AU, al-Shabaab retains the support of a core group of about 400 foreign fighters but is currently looking to expand its presence and links across the region, notably in Kenya, Sudan, and Ethiopia but perhaps further afield as well. Within Somalia, al-Shabaab’s concentrated forces have reportedly been moving north towards the northern Golis mountains. While AMISOM/FGS forces have not captured the majority of al-Shabaab’s equipment, they have received increasing numbers of defectors. This is despite the fact that al-Shabaab reportedly established a 500-strong Amniat (‘internal security’) force, specifically to stem defections. As of mid-January 2013, AMISOM was holding some 250 fighters who were disengaging from al-Shabaab, while the FGS was holding approximately 1,500. In humanitarian terms, although the famine that hit Somalia in 2011 has ended, the situation in most parts of the country is still dire. In early January 2013, the UN’s Office for the Coordination of Humanitarian Affairs (OCHA) estimated that approximately 2.1 million people were living in a state of humanitarian emergency and crisis; 1.1 million of them were internally displaced, well over half in Lower Shabelle and Banadir. Access for those aid agencies involved in humanitarian relief throughout the country remains extremely difficult. Meanwhile, Somali refugees in Kenya were being returned to Somalia against their will. In spite of these problems, the 2012 Humanitarian Appeal for Somalia received only US$ 668 million out of the requested US$ 1.1 billion—i.e. around 61 per cent. The 2013 Appeal is US$ 1.3 billion to target some 3.8 million Somalis in need. The AU review team established in December 2012 had two key tasks: to work out how best to engage with the new FGS and support its priorities, and to find a sustainable solution to AMISOM’s chronic funding problems. In mid-January 2013, the review team announced their conclusion: that AMISOM should make the transition to a new joint arrangement, whereby two parallel AU and UN missions would come together at the strategic level under a Joint Special Representative. The AU mission, the review team concluded, should remain a large, multi-dimensional force, dedicated to continued peace enforcement activities—like AMISOM but probably with some reconfiguration of the balance between its component parts. For its part, the AU wanted the UN to authorize a new peace-building office to focus on supporting the Federal Government’s priorities, including the empowerment and restructuring of the Somali security sector. At the heart of this new joint arrangement would be a more predictable source of financial support for the AU mission, which would come via the UN’s assessed contribution peacekeeping budget. The UN review team, however, came up with very different conclusions. It ruled out the deployment of a UN peacekeeping operation and instead deliberated between four forms of UN mission configurations, short of a blue-helmet operation. AMISOM was originally mandated by the AU in January 2007 but was endorsed shortly afterwards by the UN Security Council. Its existing mandate runs until 7 March 2013 and a new one is currently being debated within the AU and UN. AMISOM has never been a traditional peacekeeping operation. Rather, its mandated tasks involve a mixture of protecting government personnel and institutions, and conducting military enforcement operations against anti-government actors, principally al-Shabaab. The mission’s police component is mandated to help train, mentor and advise the Somali Police Force, although AMISOM’s Formed Police Units have the additional task of public order management. The mission is also mandated to help facilitate humanitarian relief and civil-military operations. These four mission configurations were: a UN assistance mission parallel to AMISOM and a UN Country Team; a UN peace-building mission parallel to AMISOM and the UN Support Office to AMISOM (UNSOA); an integrated UN peace-building mission, encompassing UNSOA and the UN’s Political Office for Somalia; and a joint AU-UN mission along the lines of UNAMID (The UN/AU hybrid operation in Darfur), with a separate UN Country Team. Only the fourth option—a joint AU-UN mission—would ensure AMISOM’s funding through the UN’s assessed peacekeeping budget. In its preliminary findings, the UN review team was unable to agree on a preferred option. On 26 January, the AU-UN Joint Task Force on Peace and Security suggested that both institutions deliver a joint letter to the UN Security Council, highlighting the areas of convergence in their respective reviews in time for the Security Council’s consultations on Somalia (scheduled for late February 2013). In early February, however, the UN Secretary-General Ban Ki-Moon recommended that the UN Security Council create a new UN Assistance Mission, which would deliver political and peace-building support with a presence across Somalia alongside AMISOM, UNSOA, and a UN Country Team. Probably in light of this decision, the AU appears to be moving towards adopting one of its other options, an enhanced AMISOM as an interim prelude to its preferred joint UN-AU arrangement. The final factor that will have an impact on AMISOM’s future shape and posture concerns developments elsewhere on the African continent. Somalia is no longer the principal African crisis demanding international attention and requiring external peacekeeping forces. At various stages in the last three months, the international spotlight has shifted to the eastern DRC and to Mali, both of which have seen the deployment of significant external military forces. In the DRC, an African-led Neutral International Force has been authorized to help MONUSCO, the UN mission, and the Congolese armed forces deal with the M23 rebellion. South Africa and Tanzania among other states have pledged troops. In Mali, on the back of the French intervention in January 2013 against various Islamist and Tuareg forces, approximately 6,000 African troops have been pledged to help stabilize Mali, including from Chad, Nigeria, Togo, Benin, Niger, Burkina Faso, Senegal, Guinea, and Ghana. In addition, although it has been less visible in the international media, the CAR also saw a variety of countries—including Gabon, Cameroon, Congo-Brazzaville, South Africa, and France—deploy soldiers in response to the Seleka rebellion that erupted in December 2012 and the peace deal that followed in January 2013. Each of these crises could well dilute the international focus on, and material resources available for, Somalia. In such a fluid context, AMISOM faces many challenges. First, as part of its new relationship with the Federal Government, AMISOM will have to evaluate how best to support the restructuring and empowerment of the Somali state’s National Security Forces (NSF). To date, international military assis-tance to Somalia has focused on mechanisms to strengthen AMISOM and its troop-contributing countries, rather than initiatives to support the NSF. While several countries in the region and some Western partners, including the European Union, have conducted training programmes for Somali security forces, these were not coordinated and were relatively small in scale. It was notable, for instance, that while AMISOM’s December 2011 Concept of Operations explicitly acknowledged the need for an effective partner in the form of the Somali security forces, the UN’s support package went only to AMISOM. It was left to bilateral donors to support the Somali National Army (SNA) directly: various training programmes have taken place in Uganda, Kenya, Ethiopia, and Djibouti, and the United States and Italy have provided stipends to some SNA soldiers. These support programmes will need to be enhanced, better coordinated with one another, and moved to Somalia. Washington’s official recognition of the new Somali government in mid-January 2013 paved the way for a new set of relationships between the Somali government and various Western states, as well as the international financial institutions. This will undoubtedly help the Federal Government secure access to financial assistance. But on the military front there are big practical challenges, inasmuch as AMISOM has generally been the dominant partner in its relations with the Somali army, including controlling the ammunition flows to its junior partner. There are considerable political pressures to reverse this relationship but, in practical terms, the SNA is simply not ready to take the leading role in the fight against al-Shabaab, especially beyond AMISOM’s Sector 1. At present, among the long list of challenges facing the Somali army, perhaps the most severe and urgent are problems of command and control. These are at the level of senior officers, between clan leaders, warlords, and the official military commanders; they also involve an absence of collaboration between the existing SNA brigades. Different components of the army have had different types of training, mostly abroad, and there are poor levels of training for non-commissioned officers. Salaries are unreliable: most of these have been in the form of US$ 100 per month stipends paid by the US and Italian governments to some but not all SNA soldiers. There is also a lack of modern weaponry—with many ostensibly SNA weapons belonging to warlords, clans, and individuals—and a major deficit of logistical and medical support capacity. Finally, there are problems with recruitment, created by this long list of issues. AMISOM will also have to decide how it can work with the Federal Government to encourage defections from al-Shabaab, and help fighters who have abandoned militias and armed factions make the transition into civilian livelihoods. They include fighters captured in combat, individuals who have voluntarily surrendered, and those who have blended with the local population but are probably willing to surrender if the circumstances are right. This is complicated by the absence of the kind of formal peace agreement that has helped structure many post-war disarmament, demobilization, and reintegration programmes around the world such as the Comprehensive Peace Agreements in Liberia (2003) and Sudan (2005). In late 2011, the Somali National Security and Stabilization Plan (NSSP) for 2011-2014 highlighted the need to develop programmes for disengaged fighters. Passed by presidential decree on 8 August 2012, the NSSP outlines the process by which the Federal Government will take the lead in the re-orientation of policies, structures and operational capacities of Somalia’s security and justice institutions. Assistance for some of these activities was provided by the UN Political Office for Somalia, the International Organization for Migration, and the Government of Norway, which provided financial support for the treatment and handling of disengaging combatants in several camps in Mogadishu. Today, the Federal Government is working on several pilot schemes involving amnesty programmes, weapons buy-back initiatives, and mechanisms to separate child soldiers from their adult counterparts. The first batch of child soldiers was transferred to programmes run by the UN Children’s Fund, UNICEF, in November 2012. The central problem is the lack of financial and material resources, although there are also question marks over whether the government has the technical expertise and capacity to manage such programmes, and whether they might generate animosity in a context where many government troops regularly go unpaid. Nevertheless, without financial support for outreach activities, reception and transition centres, safe houses, and efforts to transition former fighters into alternative livelihoods, their disengagement might only be temporary and disgruntled individuals could turn to banditry or re-join the insurgents. AMISOM will also need to concentrate on its own on-going military operations, especially the various consolidation operations aimed at mopping up al-Shabaab sleeper cells and agents in areas retaken by government and allied forces, and operations to secure the mission’s extended supply routes across its now large theatre of operations, especially the roads between Mogadishu and Kismayo, Baidoa, and Belet Weyne. To conduct these operations effectively, AMISOM will need the additional forces, military enablers, and expanded logistical support stipulated by UN Security Council resolution 2036, and to enhance its existing analysis, planning, and management capacities. In each of these operations, AMISOM will have to assess how best to work with the military forces representing the new Federal Government and evaluate the extent to which the Somali National Army is ready to take on a leading role. Part of this process will involve a reconfiguration of AMISOM’s force deployment to engage the threat of al-Shabaab as its fighters move north. Current threat assessments suggest that AMISOM’s Sector 4 in particular requires more personnel than the existing Djiboutian battalion stationed in Belet Weyne, although an unknown number of Ethiopian troops are also present. This reconfiguration may include an evaluation of force composition, especially in the balance between soldiers, police, and civilian staff. Although AMISOM’s recent pronouncements suggest that it will need more police and civilian personnel to conduct a variety of stabilization tasks, it also seems apparent that the Federal Government does not want AMSIOM to get too deeply involved with issues of local governance and policing, preferring instead that AMISOM remain a primarily military tool for degrading al-Shabaab. AMISOM receives funding from a variety of sources including the UN Assessed Peacekeeping Budget; the UN Trust Fund for AMISOM; the UN Trust Fund for Somali Security Forces; the AU Peace Fund; and AU/AMISOM partners, most importantly the European Union, which pays the allowances for AMISOM’s uniformed personnel, totalling approximately € 163 million in 2012. AMISOM benefits from a UN logistical support package, bilateral donations, and voluntary contributions to UN managed Trust Fund in Support of AMISOM. The European Union (EU) provides the resources needed for the payment of troop allowances and other related expenses, within the framework of the African Peace Facility (APF). The EU has, however, indicated that funds available in 2013 for the payment of troop allowances on the basis of the current UN-authorized strength of 17,731, amounts to 70 million Euros, which is only enough to cover remuneration payments for the first five months of 2013. Similarly, UNSOA’s budget is also under pressure, even as it is asked to expand its activities dramatically, across a huge and largely unsecured theatre of operations. Now that it seems clear that the UN will not fund AMISOM allowances through the assessed peacekeeping budget, additional donors will have to step forward to cover AMISOM’s costs. AMISOM has found itself at a political crossroads before, perhaps most notably after the withdrawal of Ethiopian troops from Mogadishu in early 2009, and again after the Kenyan intervention and subsequent re-entry of Ethiopian troops in late 2011. Once again, it has to adapt to a new set of circumstances. This time some of its most serious headaches arise from positive developments: the selection of a new Federal Government of Somalia that wants to assert its sovereignty; the retreat of al-Shabaab and the subsequent increasing numbers of defectors; and tentative signs of a functioning Somali national security presence. First, it is incumbent upon the AU, the UN and the Federal Government of Somalia to shape a new mandate for AMISOM that supports President Hassan’s declared priority of providing security throughout the country. This would entail a continuation of AMISOM’s enforcement operations against al-Shabaab, as well as a clarification of how the mission can best support the restructuring and empowerment of Somalia’s National Security Forces, in which AMISOM’s exit strategy depends. Second, although al-Shabaab has been displaced from its previous strongholds and has lost many fighters through defection, it still controls considerable territory, is capable of causing significant disruption, and may be expanding its activities again. It will be worth finding more resources for programmes not just to recover territory but to encourage further defections and deal with disengaging fighters. Failure to tackle these issues could result in a reversal of the recent gains made against al-Shabaab. Third, the UN, AU and AMISOM’s international supporters must give the mission the tools it needs to get the job done. As specifically stipulated in UN Security Council resolution 2036, these include predictable funding (including for allowances), key military enablers such as air assets, as well as enhanced capabilities for analysis, planning, and management activities. Interview with RVI Fellow Sally Healy, 3 February 2013; www.riftvalley.net. Katrina Manson and William Wallis, ‘African jihadists driven across borders’, Financial Times, 31 January 2013; http://on.ft.com/U5UGLS. UN Security Council, S/RES/2073 (2012), 7 November 2012; http://bit.ly/US3KCa. African Union PSC/PR/COMM. (CCCVI), ‘Communiqué’ (306th meeting of the PSC), Addis Ababa, 5 January 2012; http://bit.ly/WIiDFi. UN Security Council, S/RES/2036 (2012), 22 February 2012; http://bit.ly/114vYO0. President Hassan Sheikh Mohamoud, ‘The Future of Governance in Somalia’, speech to Center for Strategic and International Studies (CSIS), Washington DC, 17 January 2013; CSIS transcript available at http://bit.ly/Yz2ffi. African Union PSC/PR/2(CCCL), ‘Report of the Chairperson of the Commission on the Situation in Somalia’, 350th meeting of the PSC, Addis Ababa, 14 January 2013, paragraph 18; http://bit.ly/14oURCJ. ‘Third progress report of the Chairperson of the African Union Commission on the implementation of the mandate of the African Union Mission in Somalia pursuant to paragraph 21 of Security Council resolution 2036 (2012)’, (UN doc.S/2012/666,24 August 2012), paragraph 7. African Union PSC/PR/2(CCCL), paragraph 31. UN OCHA, ‘Somalia Humanitarian Bulletin: December 2012’, 4 January 2013; http://bit.ly/TNON2b. E.g. Voice of America, ‘Kenya Orders Somali Refugees to Go Home’, 23 January 2013 (http://bit.ly/VrB7dJ); The Guardian, ‘Insecurity rises in Dadaab as Kenya reveals plans to 'round up' urban Somali refugees’, 25 January 2013 (http://bit.ly/Vx4QBS). PSC/PR/Comm(LXIX), ‘Communiqué of the 69th meeting of the [AU] Peace and Security Council [PSC]’, Addis Ababa, Ethiopia, 19 January 2007: http://bit.ly/X3rdwJ. Author’s confidential interviews with UN and AU officials, January-February 2013. The NSF includes the Somali National Army (SNA), as well as the Somali Police, Somali Navy and Somali Air Force. For a relevant discussion, see Matt Bryden and Jeremy Brickhill, ‘Disarming Somalia: Lessons in Stabilisation from a Collapsed State’, Conflict, Security and Development 10/2 (2010), pp. 239-62.